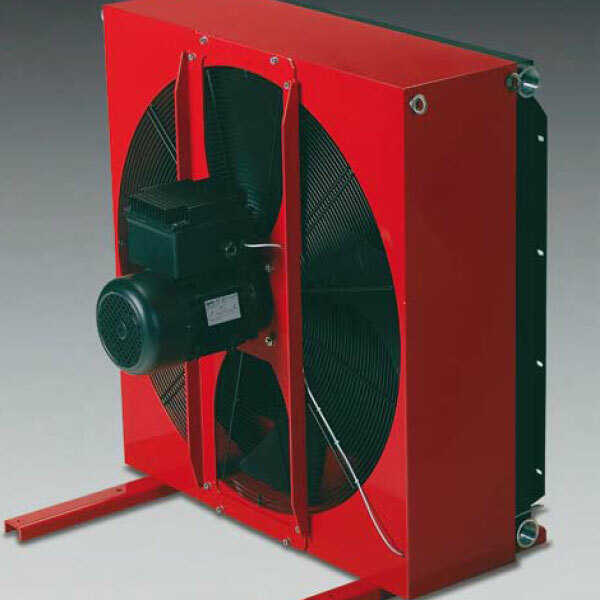 The EL MI series is a complete oil/air cooler system with an axial fan for industrial applications. In hydraulic systems, there is transformation and transmission of the energy. During this process, efficiency losses occur, i.e. with the conversion of the mechanical and hydraulic energy into heat. Indeed, it is the purpose of the cooler to dissipate this heat and to maintain the thermal balance of the hydraulic fluid. Hydraulic cooling applications, with both return line and offline versions available. OK-EL MI coolers use high-efficiency axial fans driven by motor inverter and sturdy aluminium bar-and-plate cooling elements. Therefore, this guarantees immediate adjustment to required cooling performance under changing load conditions and superior cooler durability. Cooling power, as a function of fan speed, is controlled depending on the required oil outlet temperature. The main advantage is the integration of oil temperature control via proportional fan speed into one very compact design. Further advantages are a lower noise level and lower power consumption over the term of a year.